As a top-rated SE developers we proudly offer first rank PSD to SocialEngine conversion services in the niche. SocialEngine is a popular platform with the help of which everyone can create their own social network or branded community. It supports multiple useful features such as modular widgets, plugins, unencrypted codes and much more. And furthermore, it offers various customization solutions. What is SocialEngine theme customization? Every SE-based site has a set of default themes to give it a certain appearance. But if you feel that your community requires more than that, it's a hight time to create your own unique custom design. To have an idea of a new look of your site and implement it in Photoshop is just a first step, whereas to make this new design alive on web your PSD files must be HTMLized. We offer ready-to-install templates in our store, though if you wish to create an exclusive layout on your site but don't have a ready-made PSD with you, that's not a problem! Our professional designers have a significant experience in developing different kinds of SocialEngine themes and templates. Complete the form below and describe your vision of the design, we will turn your ideas into reality. Why choose SocialEngine as a base for an online community? SocialEngine holds a leading position among the popular social networking platforms, which recently has been supported by the CMS Critic People's Choice Award, where SocialEngine became the "Best Social Network Software" for the third time. 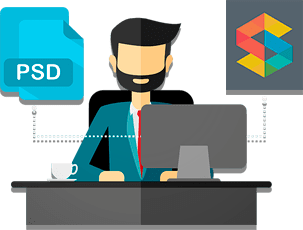 It's a flexible and smart platform, among its advantages there are certified plugins, unlimited access to PHP code, rich functionality and much more! Why SocialEngineMarket is the best choice for PSD to SocialEngine theme conversion? What are the benefits of working with SocialEngineMarket? We have a time-proven working scheme that allows us building the most comfortable environment for effective work. We reply to your queries asap and provide all the necessary information you might be interested in. We cooperate closely throughout the working process and always ready to help with refreshment or updates even if the initial project is accomplished. Our coding is fully manual, which allows us to build perfectly structured markups. This ensures that your socialengine theme will look as good as the initial mockup and be extremely friendly and functional for you community users. We are scrupulous about details. So when it comes to converting ready-made PSD files to HTML we use each pixel with special care. This allows us to guarantee pixel perfection of web pages as a result, which means they will look just as your design on the web. You never know what browser or device the members of your community going to use. To make sure all you visitors have the best user-experience on the site, we test the web pages across different browsers once the coding is over. Cross-browser compatibility allows you to expand your audience. A huge community of W3C contributors work hard on the creation of standards of HTML coding. Transforming your PSD files to SocialEngine theme, we follow all the necessary W3C requirements. That's why every web page that we deliver is lightweight and clean. Social networking is a specific field of development that requires competence to deal with. As SocialEngine recommended experts we are confident of the results we convey and always ready to provide ongoing support. First we review your request and PSD files you hand over. We reach you in order to talk over the project closely. We segment files into smaller pieces and start coding. We code these files to make them web compatible. We merge the elaborated files into SocialEngine.